The halls felt empty. Silent. No traffic. Where is everyone? We started at nine. Our teacher, Gary Kelley was delayed due to the overbooking of pilots at the end of the month.So, the games officially began at 1. The folks who did London pictures had a critique...and we talked about thesis and the things we all learned in the process. We saw the thesis show (every piece created was hung). It looks great--very big and bold. There are signs at the front of the show saying that there is mature material in this show and that one should consider wheither you could take it or not. To Mr. Richard Williams delight. Gary went through some slides and discussion and thoughts on illustration, his sources of inspiration and change. I had heard this two years ago--but it was far more meaningful and energizing today. The journey was worth it--as I have changed. He talked about Robert Weaver (must find more info on him), painting and pastels, monoprints and drawing. He talked about the tour de France, french light and color, Matisse, Milton Avery, Richard Diebenkorn,Picasso, Cubism,Tuscany, and Jazz. Robert Johnson and his singular contribution to music, his short life and history--and how it resulted in his book , " Black Cat Bone"--a place that the monotypes, passion and story all come together for Kelley. I need to see this book...and to read some about Johnson. Scott Bakal also was inspired by Johnson in his current HAS thesis work. The few images I have seen from him are dynamic and inspired. He showed us posters, books, and now huge murals way beyond the size and scale (painted with housepaint outside) for the University of Northern Iowa. Bigger, bolder than the Barnes and Noble notable murals. I like the way Gary intregrates paintings in his illustration (a Vincent VanGogh sending his ear to NPR, the Malkovich portrait for Mr. Ripley with paintings on the left,right and top--very triptych-y). His love of Matisse in his current Venus paintings is apparent and inspired. He is searching and working--constantly turning over ideas and design>>resulting in new work, new thinking and a fresh body of work. Yesterday was yesterday. His ten year old work is as fresh as tomorrow. I wish I could be more like that. Our project is based on "blue". There is a wealth there. Thumbnails by 11. tomorrow. I have developed BlueBird of Happiness valentine, Bluestocking or even blueribbon bluestocking, blue bayou and the blue boy, Krishna (blue being the color of the god's skin that indicates his divine nature). 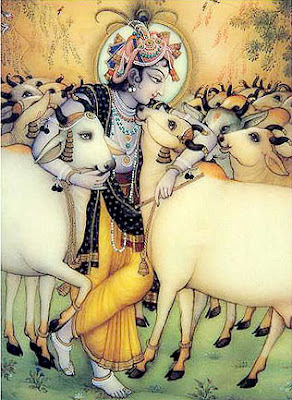 I am liking the bluebird of happiness valentine and the work on Krishna and his little lovely cows. I talk about my work tomorrow to the thesis folks. Have to sleep now.